Anyone who has ever browsed Etsy shops knows there are a lot of literary-minded crafters out there. 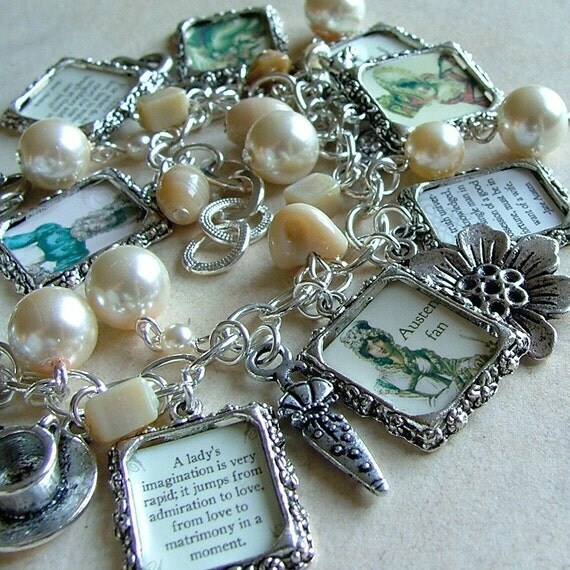 One of my favorite things is bookish jewelry. (I even make it on occasion) Ranging from simple to incredibly elaborate to somewhat startling, there's a huge readerly fanbase out there, churning out accessories for us bookishly inclined. Bookish jewelry can be simple, like this book nerd necklace from Bookish Charm that I find myself coveting. Flavorwire featured reader accessories, like this awesomesauce typewriter necklace. One of my absolute favorite, most beautifully-finished pieces I've come across is this insane cuff bracelet from the JezebelCharms shop. So basically, there's a ton out there. Lots and lots to love for any book-lover. I could pretty much post a new piece daily and not even begin to scratch the surface. So what's your favorite piece? Did I miss something out there that I really should have included in this? 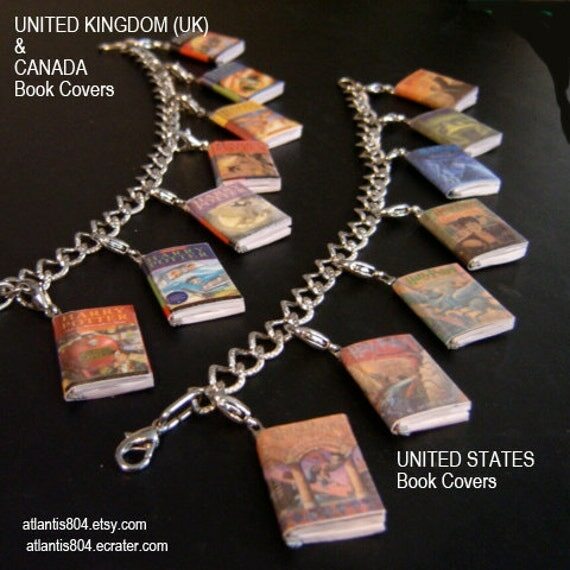 Do you buy, wear or make bookish jewelry? Tell us about it in the comments! Swoon, love so many of those items...just not sure which one I would buy first! Those are very cool. I make jewelry but I mostly keep it to Halloween jewelry. I have been wanting to make some "book" jewelry, but haven't found the right pieces. I'll be keeping my eye out more and these were very inspiring. I am usually not a jewelry person but I would love to have some of these, especially the charm bracelet. Thanks for the Etsy information! I had not heard of it before. Not just jewelry but lots of book related art! There goes my bank account. Oh I love the charm bracelet! Definitely my favorite. 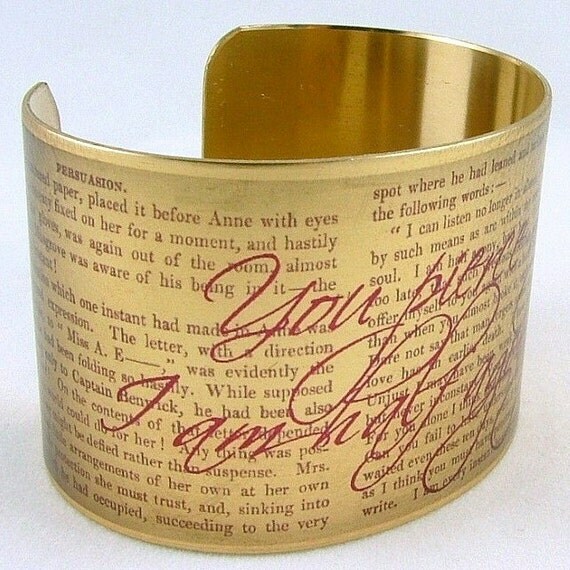 You had to know I would surface for the Austen cuff! I love cuffs anyway, but this--! I don't even know what to say! OMG I love them all. So much so that I can't choose which I like best. ZOMG, I'm in love with those cuff bracelets! Yeah, I'll be needing one of those bracelets. 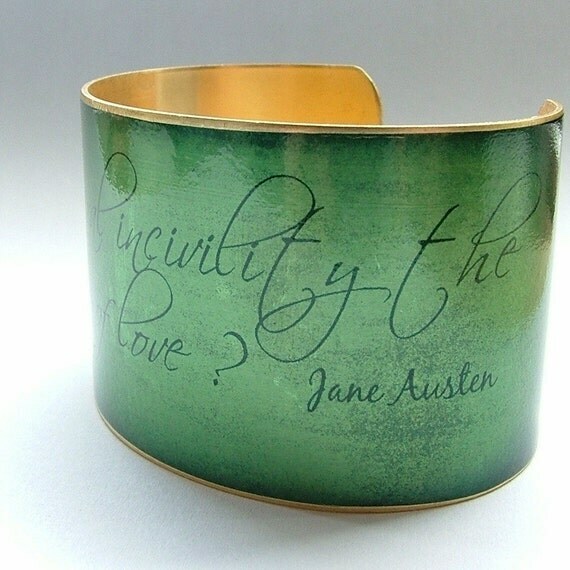 LOVE the Jane Austen jewelry especially. Oh and the typewriter. Oh hell, all of it looks amazing.